Providing you the best range of panasonic kx hts 824 sx wifi pbx telephone system, panasonic kx ns300 ip epabx system and poe smart switch with effective & timely delivery. Usage/Application 6 CO + 2 Digital + 16 Extn. We are successfully meeting the varied requirements of our clients by providing the best quality range of KX-NS300 Panasonic EPABX System. 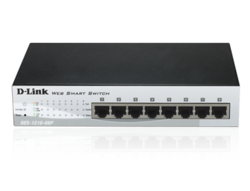 DES-1210-08P is a new PoE switch of D-Link’s Web Smart series. With 8 10/100 PoE ports, it supplies up to 15.4 watts of power each port following IEEE 802.3af. Providing functions of Auto Surveillance VLAN and Voice VLAN, SMBs can easily deploy powered IP surveillance system and VoIP systems. The Smart DES-1210-08P is also equipped with advanced security and QoS, such as ACL, bandwidth control, port security, and ARP Spoofing Prevention. It is the best choice for SMBs considering functions and installation cost.